Beautiful Pave diamond and Tanzanite ring. This ring features an oval Tanzanite AAA color, very clean .90ct gemstone. Pave set diamonds are SI 1 clarity G color and total .23ct tw. Order this ring as shown or in 14k yellow gold, 18kt gold, even Platinum. 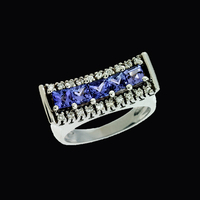 Enticing 14k White gold Tanzanite and diamond ring. Beautiful Tanzanite is .97ct gem and measures 6mm square. The tanzanite gemstone is a square cushion cut stone. Round diamonds are a lovely accent in this ring and 30 of them total .19ct tw. They are micro-pave set. We're happy to size this ring but size items are custom and non returnable. Pretty 14k White gold set with a genuine clean Tanzanite .90ctw, AAA color. Channel set diamonds total .30ct tw and are SI 1 clarity G color. This made to order ring is available in 14k yellow, 18k gold's, or Platinum. 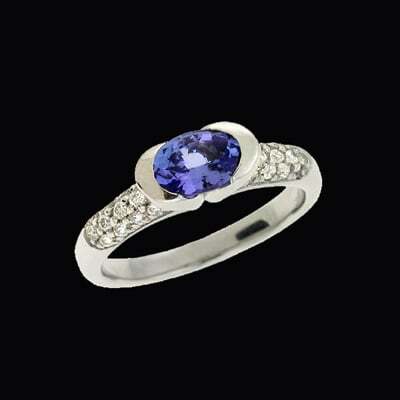 Beautiful Tanzanite and Diamond ring. 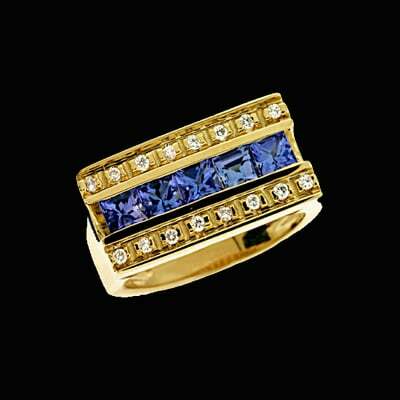 14k Yellow gold flat top design ring is set with 1.25ct genuine Tanzanite and .16ctw diamonds. Tanzanite's are clean with AAA color. Diamonds are SI 1 clarity G color. Also available in 14k White, 18kt gold, and Platinum. Made to order ring. 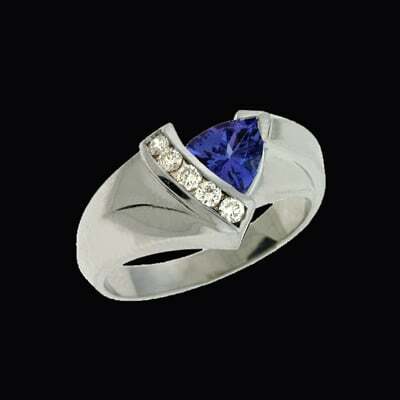 14k White gold Tanzanite and Diamond ring. Tanzanite is a genuine trillion cut gemstone AAA color, very clean stone weighing .78ct. Diamonds are SI 1 clarity G color and total .16ctw. Ring is also available in 14k Yellow, 18kt gold, or Platinum. 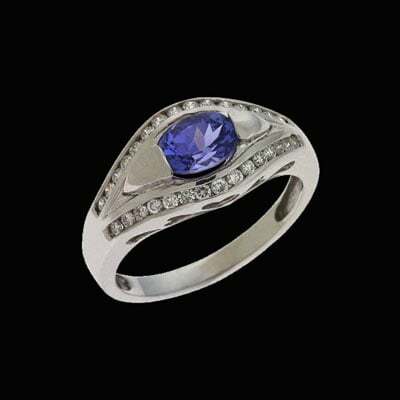 Pretty 14k White gold concave bar design Tanzanite and diamond ring. This exciting cutting edge design ring is set with 1.25ctw square genuine Tanzanite AAA color clean stones. Diamonds border Tanzanite are SI 1 clarity, G color and total .22ctw. Also available in 14k yellow, 18kt gold, or Platinum use request for pricing.